You could have at least removed the Home Depot tags from them. No really they look great anyone should be proud to buy such plants. What a great day for you. Your plants were beautiful. Do you do a year round market or does yours start this early? We were preparing for the markets today. We planted 22 rows of corn earlier this week and today we covered 1/2 with wire hoops and made a low tunnel for each row. Planted up lettuce, a row of tomatoes, a row of zucchini's a couple days ago and covered them, too. Ran and picked up the bees I ordered a few weeks ago and dumped them into hives... buzzy busy day, got the plastic down for cabbage and broccoli but ran out of day light to get it in... soon the markets will be starting here. Thanks again. The other market in town is year-round, but not the one I attend. By the time winter comes, I am usually happy for the break. I really like selling plants. I get to tell everyone about tomatoville and the dwarf project. My plant season only lasts about six weeks, though. I have to make the most of it when I can. Great looking plants Cole! You are an inspiration to backyard growers like me. I love selling plants. I hope to someday make a living from it, then I would be happy to go to work everyday. From everything I read about the greenhouse business, it seems that only the spring season for selling bedding plants has a chance of being profitable. 20-30 years ago, a greenhouse would grow fall mums and then Christmas poinsettias to stay busy year-round. But with the modern reality of lower prices due to international competition, those two products are not nearly as profitable as they used to be. I'm sure I could grow something in the greenhouse over the summer and fall, but that is the time of year when anything will grow in the outdoor garden, so there's not much point. With all the unique varieties I learn about through tomatoville and get through seed swaps, I really don't face any competition at all as a market vendor of plants. No one else is ever going to have the selection I offer. I hoping it will be the same in selling the actual tomatoes themselves. Taxi is the yellow. There's a few Oranze in there. The red is mostly Gribovsky. The cherry mix is my Sungold, Sunlemon, Sunpeach, and Sun Chocola blend. There's a few Tiger-like and Helsing Junction Blues mixed in. There was a daily vendor selling heirlooms next to me. They had them priced at $4/lb. The rest of the vendors selling tomatoes had them at $1.75/lb.. Mine are $3 for a 2 lb box. I walked over and told her I was her neighbor vendor and that her tomatoes looked nice. I asked her what varieties she was growing, and she couldn't tell me. I asked about the big red one, and she called it "an Amish something or other." The name Red Brandywine did not ring a bell with her, but I think that's what it is. She was really nice when I bought one. I doubt she realized I was buying it to save the seeds. 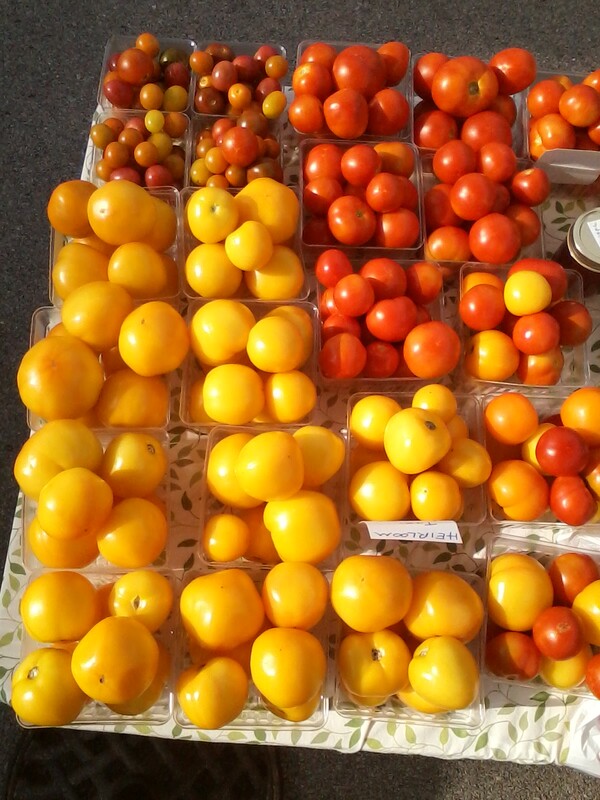 Cole, your tomatoes are so pretty and perfect. I would buy from you. Thank you. I just ate a little of the one I bought as I was taking the seeds out of it. It was ok, but I wasn't super impressed. She mentioned they were grown in a high tunnel, and it did have that watered-too-much flavor that I have experienced in my own high tunnel. Maybe you can teach her, sounds as if she could use a bit of expertise. I just looked up SunChocola F1. They are pricey! Do you need to charge more with such expensive seeds. They get rave reviews though.